The title, “27122015_EU_D-BER_SONNENALLEE” is derived from the title digital file displayed on his SD card. On 27 December, 2015, he found a teddy bear at S-Bahnhof SONNENALLEE. He felt that the bear represented the city of Berlin, which had been left behind for years. 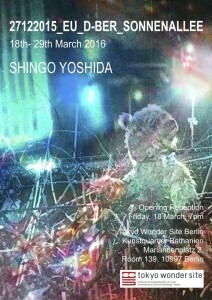 Through the new work, Yoshida wants to facilitate and share dialogues with the audience about their anxiety and expectation in the past, the present, and the future and want them to feel them directly in his installation work.